Here are 7 videos to give you everything you need to know about dental implants. Are implants safe & how long do they last? What is a sinus lift or bone graft? Are implants safe and how long do they last? Am I suitable for Implants? Is the treatment expensive? Does it hurt? At what age should implants be placed? How is the treatment obtained? An accurate cost estimate can be obtained from your dentist or dental specialist. This is often given in the form of a quotation. The components chosen will depend on the type of treatment needed. In addition to component costs, there will be professional fees and may be hospitalisation and medicine costs. In general, implant treatment is not much more expensive than the alternatives (bridges or new dentures at shorter recurring intervals). The big difference lies with long-term success. Implants can be with you for the rest of your life, if cared for properly. The youngest patients receiving implants are in their late teens, and the oldest in their 90’s. What often happens where there are missing teeth, is that the jawbone begins to shrink. This is common with denture wearers, and the ridge which is important for holding the denture, gradually disappears, affecting the fit of the denture. 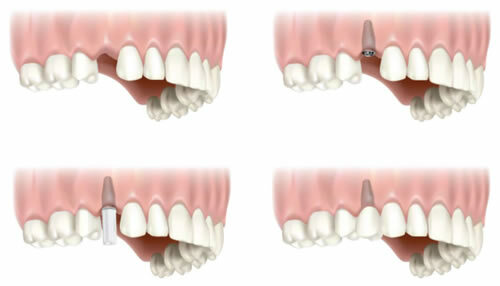 Tooth implants restore normal loading of the bone and thereby hinder this further loss of bone. The sooner you decide to have the implants placed, the less the permanent loss of bone will be and the easier it is for the dentist to achieve a good aesthetic result. Implant treatment is a technical and complex form of dentistry. Not all dentists wish, or are trained, to provide implant treatment. For this reason, your dentist might refer you to a specialist for part or all of the implant treatment. The surgery (placing of the implant) is done by a Maxillo-Facial and Oral Surgeon, a Periodontist, or a Dentist. The design and construction of the artificial teeth is done by a Dentist or Prosthodontist working in conjunction with a Dental Technician. Ask your dentist about your implant treatment options today. 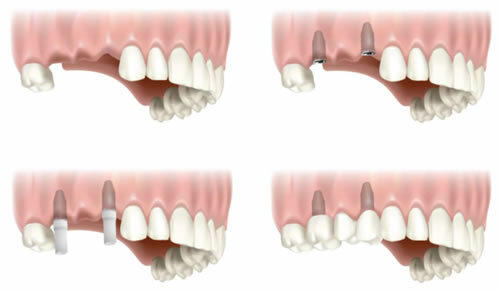 In previous years, the only options to replace a missing tooth was to either wear a removable, single tooth denture, or to place a bridge that attaches to the teeth either side of the missing tooth.The disadvantage of placing a bridge is that the healthy teeth either side of the gap need to be ground down, so that the two crowns on the bridge can be placed over the remaining tooth foundation. With the advent of permanent implants, the single missing tooth may be replaced without doing any damage to the neighboring teeth. This gives a permanent, naturally functioning solution, by placing a single implant. The implant is very similar in shape and size to a natural tooth’s root. Once it has been placed in the area of the missing tooth, it then integrates or bonds to the facial bone through a process called osseointegration, replacing the root of the natural tooth. Once the implant has integrated, a mold is taken of your mouth, so that a tooth can be manufactured to fit on top of the implant. After approximately a week or two, the final tooth which is made of ceramic, can be attached to the implant. The result is a natural looking crown that will have great long-term success, if looked after properly. When two or more teeth are missing in the mouth, a removable multiple tooth plastic or metal denture can be worn, alternatively a fixed multiple tooth bridge can be manufactured to replace these teeth which rests on the remaining natural teeth. When wearing dentures or a fixed bridge, the natural bone at the site of the missing teeth still shrinks, requiring them to be re-made after a number of years. In addition, a bridge damages the natural teeth it rests on, since they have to be ground down to hold the bridge in place. A bridge that rests on two or more implants, does not damage any healthy teeth, and prevents the shrinkage of the natural bone. The number of implants needed would be dependent on the number of missing teeth and determined by your consulting dentist. Once the implants have been successfully placed, a mould would be taken of your mouth by your dentist, to enable a dental technician to manufacture a permanent ceramic bridge. This bridge is then secured onto the implants using tiny gold screws, or a permanent adhesive or glue, thus replacing the missing teeth. Once this process has been completed, you will have normal function in your mouth. There are three options available when all teeth are missing in either the upper or lower jaw. The first being a standard removable denture, which rests on the remaining gums in your mouth. The second removable option allows a full denture with teeth to be manufactured which rests on a number of implants in your mouth. Small attachments are placed on top of the implants, with corresponding clips embedded in the denture. When the denture is placed into your mouth, it ‘clips’ onto the implants, and is held very firmly in place. Unlike a standard denture, it is far more stable and will not move around in the mouth. In order to remove the denture, it can easily be unclipped with your fingers by lifting the denture. Due to the substantial increased stability of the denture in the case of the upper jaw, the palate area of the denture can be removed, thus taste and sensation is restored to the natural palate. 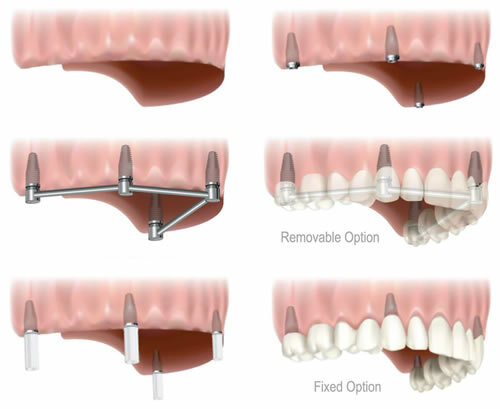 In the case of the fixed option, a full arch ceramic bridge is permanently secured to the implants using gold screws. Once this is completed, normal function is restored to your teeth. Four or more implants are usually used, and only your dentist can remove it if necessary. As with all implants, impeccable oral hygiene is needed. What is a sinus lift / bone graft? In certain cases where the natural teeth have been missing for a long time, the natural bone may have shrunk excessively to the point that implants cannot be placed in the normal way. 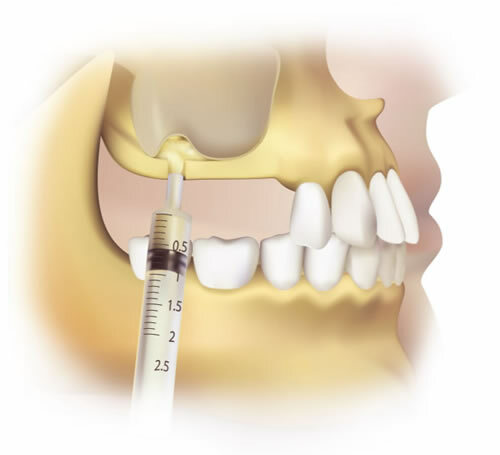 In order to place the implants, a sinus lift or bone graft would be necessary. Here bone is added to the area where the implants are to be placed, thickening the bone to provide sufficient bone support for the implants once placed. In the upper jaw this procedure is called a ‘Sinus Lift’ or ‘Sinus Graft’, and in the lower jaw, a ‘bone graft’. As the placement of implants has become more popular, this procedure has become very common practice. It is done by gently lifting the membrane that lines the inside of your sinus away from the sinus floor, and placing bone into this space, which thickens the upper jaw. The graft is then left for about 6 months to develop it’s own blood supply and turn into natural bone. After this healing period, the tooth implants can be placed provided there are no complications. The bone used could be your own natural bone, or donor bone from the ‘Bone Bank’. Your surgeon will discuss these options with you during your consultation. Patients who have implants must commit themselves to a lifetime of stringent oral hygiene practices. This is to ensure that the gingival tissues surrounding the implant remain healthy, with no plaque accumulating around any natural teeth, the prosthesis or implant(s). This involves the effective control and removal of food debris, negative (bad) bacteria, and their by-products in the mouth. If not removed, the by-products of the bacteria cause an inflammation of the gum and can proceed to destroy the bone around the implant. This is called gingivitis and peri-implantitis, and is usually indicated by bleeding gums. 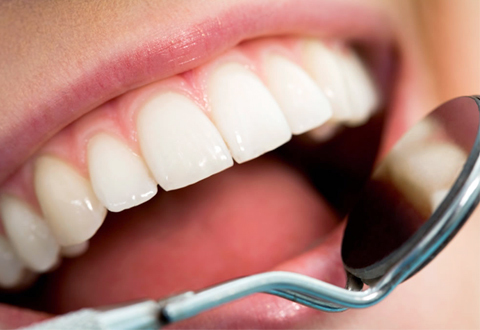 A mouth free of plaque is not only beneficial to your oral environment, but also to your body. Studies have proven that bad dental bacteria can have a negative effect on your health. Brush at least twice a day; after breakfast and before going to bed at night, using an electric or manual toothbrush. Apply the appropriate interdental tools daily using floss, an interdental brush and/or a single tufted brush. An oral irrigator is also highly recommendable. Using a manual toothbrush, position the brush head on the last tooth on the side of the cheek at a 45° angle. Apply a vibratory circular motion for ten counts. Move onto the next tooth and repeat the same procedure, moving along the arch until all teeth have been brushed. Brush all surfaces of your teeth/prosthesis in this way. Do not forget the surface of the tongue. An electric toothbrush can be used once the implants are fully integrated. Position the head of the toothbrush on the last tooth in your arch. Angulate it towards the back, middle and front of the tooth 3-4 times per tooth repeatedly, following the curvature of the tooth. Move on to the next tooth and repeat the same procedure. Brush all surfaces of your teeth/prosthesis in this way, and don’t forget the surface of the tongue. Familiarize yourself with the position of your implants in relation to your prosthesis. It is crucial that the base of the prosthesis and the gum is kept free of plaque. The Superfloss or G.U.M Implant floss has a rigid end that is used to thread the floss between the base of the prosthesis and the gum. Manoeuver the floss in a see-saw motion, utilizing the fluffy part to clean off any plaque. Ensure to clean between every implant. There is often an extension at the end of a full arch prosthesis; hook the floss over the end and pull it forward till it stops at the next implant. If you battle to insert the tip of the floss, use a floss threader. Cylindrical: To be used where there is more space between the gum and the prosthesis. Talk to us about implants – book now!